These two images I took from a high speed video, filmed at 420 fps. They follow each other directly, so they have been shot less than 2.4 milliseconds apart. Setup: paper rose with styrofoam shaft, 4ft bullwhip. In the first picture, the whip just touches the shaft, see the cracker (blurred) on the right. 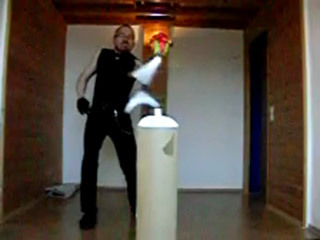 About 2.4 milliseconds later, the shaft is cut completely, while the rose still remains in its original position! This is the original video. Sorry for blurred image, the camera´s resolution is just 240/180 px at this speed.